Josue is a very happy 4-year-old boy who loves Lightning McQueen, playing games with his little sister and friends, and watching movies. Josue was diagnosed with a Specific Developmental Disorder of Motor Function and a Mixed Receptive-Expressive Language Disorder. He started receiving speech therapy services with Therapy 2000 in May of 2018. When therapy began, Josue had a vocabulary of approximately 5 words, could not follow simple 1-2 step directions, and only communicated via gestures and single word utterances at times. 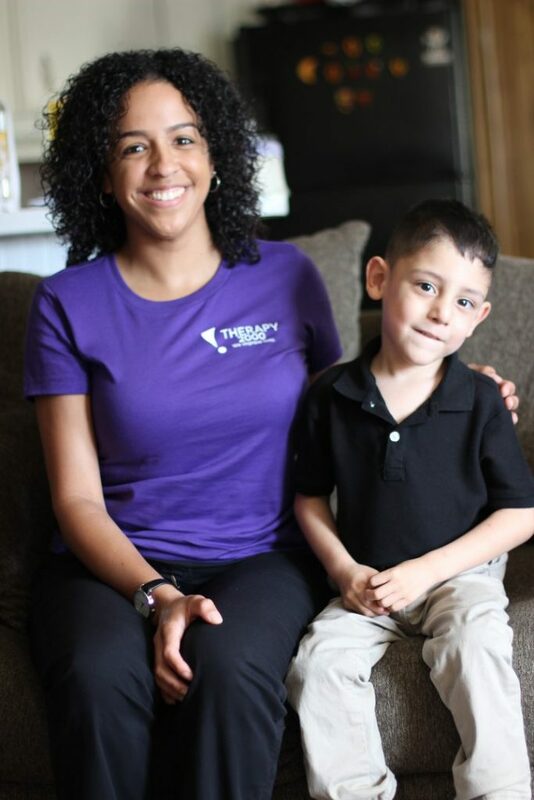 Ashley Jarrett met Josue when she was shadowing physical therapist Emily Parks, as a new employee. Josue had been waiting for ST services for approximately 2 years, although he was out of her treatment are Ashely wanted to work with Josue over the summer. After only 2 and a half months of services, Josue is now able to speak in three to four-word utterances, identify all his body parts, label common objects, follow 2-step directions, request help, and communicate wants/needs in English and Spanish. Josue has come a long way in such a short amount of time due to his hard work, mom’s willingness and motivation to work with him daily, and a physical therapist who went above and beyond to recommend speech/language services to help this awesome kid and family! Ashley is so proud of all the progress they were able to make and the goals they were able to accomplish in such a short time! After Ashley started working with Josue, Emily was able to notice a huge increase in his talking during physical therapy sessions. Josue was able to name all the colors for the toys that we typically play with. Also, instead of pointing at the toy he wanted to play with, he would say words such as “block”, “ball”, or “step”. Prior to working with speech therapy, Josue was very quiet and shy. Emily is amazed at how quickly Josue was able to learn new words and come out of his shell!